Following the successful launch of the new Elite Fight Night (EFN) Champions League last month, preparations are now well underway for the second in the series of four qualifying events that will culminate in a grand finale at the Kings Cup on December 5. Just as with EFN Champions League Round 1, the second event in the series is set to be held at Asiatique in central Bangkok. EFN Champions League Round 2 will also follow the same 4-man qualifying tournament with the winner booking his place in the prestigious King’s Cup on December 5. The fightcard for EFN Champions League Round 2 has now been finalized and has a very international feel. With Thai fighter Changgpuerk winning EFN Champions League Round 1 and booking his place at the Kings Cup, there will be no Thai fighters in Round 2. The four confirmed fighters are Jayy Tonkin of Australia, Salah Khalifa of England, James Heelan of Ireland and Jerson Constantino from Brazil. While EFN Champions League Round 2 will take place at the same venue and follow the same 4-man format as the debut event, there are also some fundamental differences. 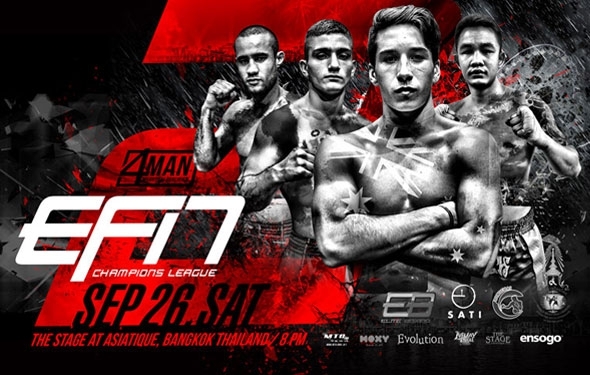 Whereas EFN Champions League Round 1 included 2 MMA superfights in support of a campaign by AIMS to promote both muaythai and jiu jitsu, Round 2 will see Elite Boxing joining forces with local charity SATI to promote women’s rights and empowerment.